In the aftermath of our ship going to Djibouti, and my subsequent return to Tehran, the Saudi bombing campaign has only increased. The total number of Yemenis now dead is estimated to be well over 4,000. The Saudi bombers, being refueled by the US air force and directed by US satellites, are specifically targeting the region of Hodiedah, where we intended to deliver the food and supplies. Aid for civilians in Houthi run areas of Yemen is forbidden. I Have Witnessed A Crime Against Humanity! From the Port of Djibouti in North Africa, it is with great sadness and burning outrage that I announce that the voyage of the Iran Shahed Rescue Ship has concluded. We will not reach our destination at the Port of Hodiedah in Yemen to deliver humanitarian aid. The unsuccessful conclusion of our mission is the result of only one thing: US-backed Saudi Terrorism. Yesterday, as it appeared our arrival was imminent, the Saudi forces bombed the port of Hodiedah. They didn’t just bomb the port once, or even twice. The Saudi forces bombed the port of Hodeidah a total of eight times in a single day! The total number of innocent dock workers, sailors, longshoremen, and bystanders killed by these eight airstrikes is still being calculated. Furthermore, the Yemeni revolutionaries arrested 15 people yesterday, who were part of a conspiracy to attack our vessel. The plan was to attack the Iran Shahed when we arrived, and kill everyone onboard, including me. There Will Be No Saudi Inspection Of This Ship! 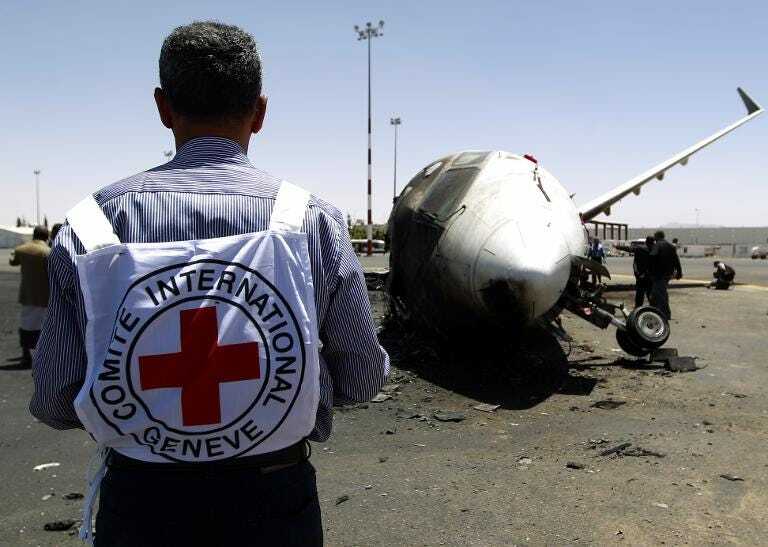 Regardless of any different viewpoint in western or other media, one fact should be well observed: Iran’s government and Red Crescent Society state correctly, that the Saudis have no right whatsoever to inspect this ship and – in addition to that – consider Saudi Arabia unfit for any inspection of this humanitarian mission due to its leading role in the war against Yemen, same as the US. UN, ICRC or other countries appointed by concerned institutions and not involved in the war against Yemen are naturally welcome on board of “Iran Shahed” for inspection. made that absolutely clear, and all of us in the delegation of peace activists from Germany, France, and the United States absolutely agree with this decision. I am onboard the “Iran Shahed”, the rescue ship sent by the Red Crescent Society of the Islamic Republic of Iran. We are hoping to bring aid to the people of Yemen who are enduring a horrendous attack from the Kingdom of Saudi Arabia. Just yesterday, we heard reports that the Saudi regime is using “White Phosphorous” in civilian areas in Yemen. “White Phosphorous” is a chemical weapon in the form of a white powder that burns human flesh on contact. The rate of civilian deaths in Yemen is particularly high. The Saudi bombs have killed very few combatants. The overwhelming majority of those who have been killed, over three thousand so far, have been civilians. Meanwhile, the United States is not just backing and arming Saudi Arabia, but it has actively been refueling the Saudi bombers. The US military is filling up the fuel tanks of the airplanes which are conducting the bombing raids, targeting schools, hospitals and civilian infrastructure. Our journey is progressing and our vessel has passed through the Persian Gulf, and now entered the both famous and infamous Gulf of Aden. The Gulf of Aden is a small strip of ocean between the Arabian Peninsula and the African continent. This small but vital area has been mentioned in world news quite a few times in the past years, mainly for two very common occurrences, piracy and migration. Let Us Help The Yemeni People! I have just heard what the US officials have said, and I must say that I and all the other peace activists aboard the Iran Shahed are filled with burning outrage. Why should we drop the goods in Djibouti and let the United Nations deliver them for us? Why should we trust the United Nations, which has stood by and allowed the Saudi military to destroy Yemen and slaughter thousands of innocent people? Why should we specifically trust the United Nations Relief Works Agency, which has a history of disgusting scandals, mismanaging assistance to those in need? The United Nations cannot be trusted.